BACKGROUND. Laparoscopic rectopexy in the treatment of rectal prolapse have good results and many advantages of minimally invasive surgery compared to coventional open surgery. OBJECTIVES. Evaluate the safety and efficacy of laparoscopic rectopexy. METHOD. 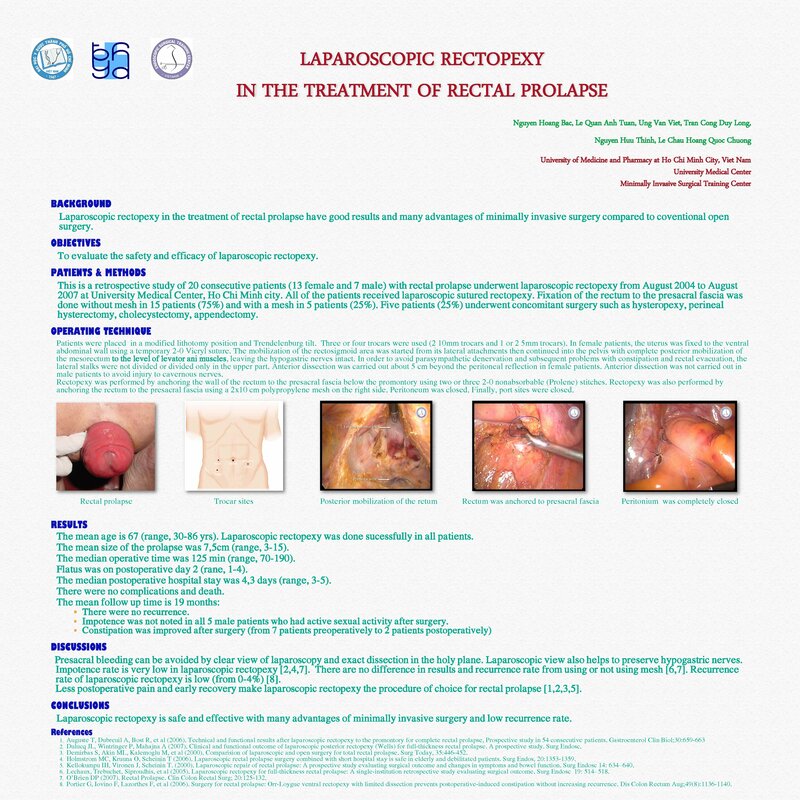 This is a retrospective study of 20 patients with rectal prolapse underwent laparoscopic rectopexy from August 2004 to August 2007 at University Medical Center, Ho Chi Minh city. RESULTS. The mean age is 67 (30-86 yrs). Laparoscopic rectopexy was done sucessfully in all patients. Fixation to the presacral fascia was done without mesh in fifteen patients (75%) and with a mesh in 5 patients (25%). Five patients (25%) underwent concomitant surgery such as hysteropexy, perineal hysterectomy, cholecystectomy, appendectomy. The mean operative time was 125 minutes (70-190 minutes). Flatus was on postoperative day 2. The mean postoperative hospital stay was 4,3 days. There was no complications and death. The mean follow up time is 19 months. CONCLUSIONS. Laparoscopic rectopexy is safe and effective with many advantages of minimally invasive surgery and low recurrence rate.